(Exiles#35) - "Fantastic Voyage: Part 1 of 3" - Reunited after having their space-time trajectories disrupted by a chaos spell, the team of reality-hopping mutants known as the Exiles were transported to a world where Reed Richards, Ben Grimm, Johnny Storm, and Susan Storm were mere minutes away from gaining their super-powers. The Exiles materialized in the back of Reed Richard's space vessel while it was on its maiden voyage. Although Richards and his companions were alarmed by the sudden appearance of the Exiles, they were soon preoccupied with the cosmic rays that were bombarding their vessel. As the Exiles member known as Magik (Illyana Rasputin) cast an absorption spell to shield her fellow Exiles from the mutating effects of the cosmic rays, the shape-shifting Exile known as Morph used his mutant powers to line the vessel and prevent the hull from breaking up. After a rough landing fifteen minutes outside New York City, the Exiles informed the Fantastic Four that they originated from alternate realities. The Exiles then helped the Fantastic Four deal with the trauma of their powers first manifesting. Everything was going according to plan, until Ben Grimm mutated into a giant, savage "Thing." The savage Thing made short work of the Exiles and the inexperienced Fantastic Four, leaving them bruised and battered as he made his way toward New York City. (Exiles#36) - "Fantastic Voyage: Part 2 of 3" - With no other active super-heroes to rely on, the Exiles and the Fantastic Four decided to follow the Thing to New York City while Reed Richards and Morph went to contact a scientist to help Richards find a way to reverse Ben Grimm's transformation. Exiles members Mimic (Calvin Rankin) and Sasquatch (Dr. Heather McDaniel Hudson) confronted the savage Thing on the Brooklyn Bridge while Susan Storm, Johnny Storm, and Exiles members Magik, Nocturne (Talia Joseph "TJ" Wagner) and Sunfire (Mariko Yashida) used their powers to direct the stampede of frightened New Yorkers caused by the Thing's rampage. Meanwhile, at Stark Industries in downtown Manhattan, Reed Richards and Morph began work with Tony Stark and Dr. Otto Octavius on a way to reverse Ben Grimm's condition. 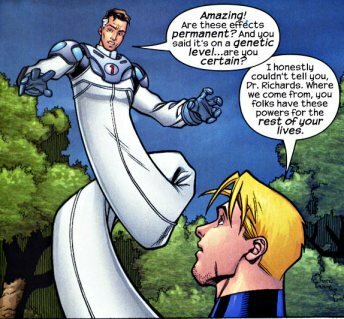 After examining fragments from the Thing's body, Reed Richards discovered a way to restructure Ben's molecules. As Mimic and Sasquatch continued to battle the Thing in New York Harbor, Reed Richards, Morph, and Tony Stark arrived on the scene and hit the Thing with an energy containment field that began realigning Ben Grimm's new genetic makeup. The process expunged enough of the cosmic radiation so that Benn Grimm could once again regain complete control of his faculties. But just when the heroes thought the crisis was over, a severely injured Mimic revealed to Sasquatch that he was implanted with a parasitic Brood Queen egg while in a previous alternate reality. (Exiles#37) - "Fantastic Voyage: Part 3 of 3" - With the Brood egg hatched within his body, Mimic began to metamorphosize into a Brood Queen as his personality became loyal to the Brood hive. 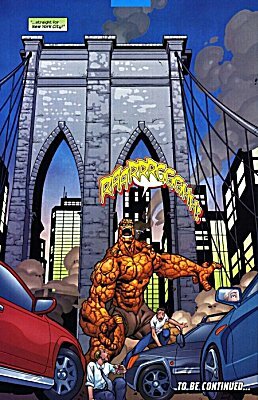 As his strained mutant healing factor unsuccessfully attempted to kill the newly-hatched Brood embryo inside his body, Mimic attacked Morph, Reed Richards, and Tony Stark until he was confronted by the rehabilitated Ben Grimm and forced to retreat to another section of New York City. Minutes later, the Brood-infected Mimic attacked Johnny Storm, Sue Storm, and the remaining Exiles in downtown New York City. 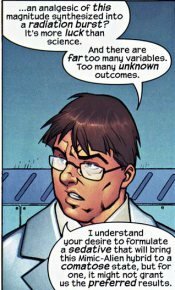 Later, in his private laboratory, Tony Stark worked with Reed Richards and Otto Octavius on a sedative that would bring the Mimic-Brood hybrid to a comatose state so that his healing factor could get a foothold and kill off the Brood Queen embryo within him. As the Mimic-Brood hybrid continued to battle the assembled heroes in downtown New York, he found that his new Brood-mutant physiology allowed him to copy all of their powers -- making him an even more formidable foe. Finally, Reed Richards arrived at the battle with a device designed to to stop Mimic's rampage. As the Exile known as Nocturne used her mutant ability to possess Mimic's body, Ben Grimm pierced Mimic's organic steel armor with a device that emitted radiation laced with synthesized narcotics -- which slowed Mimic down long enough for his healing factor to kill the Brood embryo within him. Although Mimic was now back to his old former self, the Exile known as Sunfire suffocated under a collapsed building during the battle. (Exiles#43) - "Blink in Time: Part 1 of 3" - As the mutant known as Blink (Clarice Ferguson) took the deceased Sunfire's spot on the team, the grieving Exiles jumped to another alternate reality. Although very little was revealed about the history of Earth-Fantastic Voyage, it seems remarkably similar to the history of the mainstream Earth-616. In EXILES#35, Reed Richards revealed that alternate reality versions of Captain America and the Invaders operated at one time on Earth-Fantastic Voyage (presumably in the World War II era), followed by a long period void of any overt superhuman activity. It is possible that Earth-Fantastic Voyage diverged from Earth-616 at the point of the Exiles' arrival. It would be interesting to see the Exiles return to Earth-Fantastic Voyage someday -- perhaps 10 years or so after the Fantastic Four gained their powers. 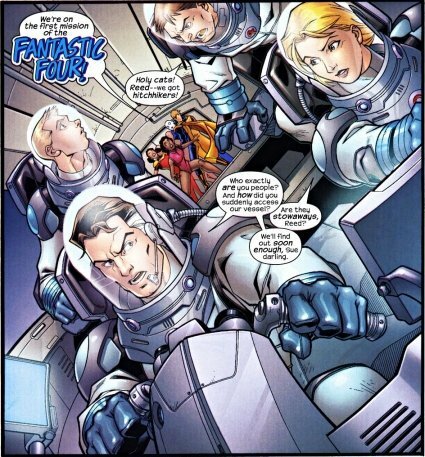 The Exiles' interference during the team's formation had to have some sort of long-term effect on this reality's Fantastic Four, for better or for worse. 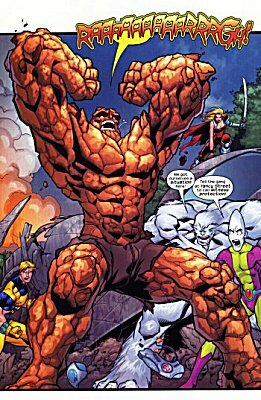 Morph seemed to be the only Exiles member with any reservations about interfering in the events surrounding the formation of the Fantastic Four, which was supposed to be a defining moment for the team. After being bombarded by cosmic radiation while piloting Reed Richard's experimental space flight, Ben Grimm mutated into a giant, savage "Thing." Badly beating his friends and the team of reality-hopping of mutants known as the Exiles, the mutated Grimm headed toward New York City on a path of destruction. Fortunately, Grimm was slowed down by Mimic and Sasquatch of the Exiles while Reed Richards worked on a device to expunge some of the cosmic radiation that caused his violent mutation. Richards' plan worked and Grimm, although still mutated, had his molecules restructured and regained control of his senses. Later, when the Brood-implanted mutant known as Mimic went on a rampage, the rehabilitated Ben Grimm was on hand to fight him. While stranded for four years on an alternate Earth completely overrun by the Brood, the reality-hopping mutant known as Mimic (Calvin Rankin) of the Exiles was implanted with a Queen egg by the Brood Queen. 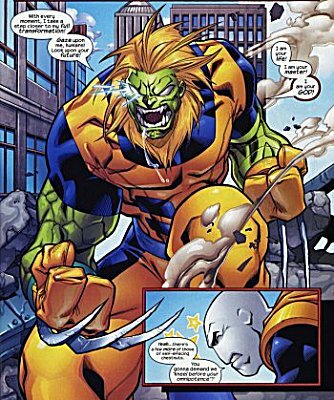 Mimic had been implanted with Brood eggs twice before, but his mutant healing factor killed them off. But when he was transported to a reality where Ben Grimm became a savage monster and was forced to battle a rampaging Thing, Mimic's healing factor was put under too much of a strain and it was unable to kill off the remaining Queen egg within his body. After the Thing was finally subdued, the Brood embryo hatched within him and Mimic began to metamorphosize into a Brood Queen as his personality became loyal to the Brood hive. In addition to possessing the healing factor and claws of Wolverine, the strength of the Beast, the speed of Northstar, the optic blasts of Cyclops, and the organic steel skin of Colossus, the implanted Mimic soon found that his new unique Brood and mutant physiology enabled him to copy the powers of any super-powered being he came near. Gaining the flame control of Sunfire and Johnny Storm, the teleportation powers of Magik, the hex bolts and possession powers of Nocturne, the invulnerability and strength of Ben Grimm, and the shape-shifting powers of Morph, the Mimic-Brood hybrid was easily able to battle the combined forces of the Exiles and Fantastic Four. Finally, Reed Richards arrived at the battle with a device designed to to stop Mimic's rampage. As the Exile known as Nocturne used her mutant ability to possess Mimic's body, Ben Grimm pierced Mimic's organic steel armor with a device that emitted radiation laced with synthesized narcotics -- which slowed Mimic down long enough for his healing factor to kill the Brood embryo within him and return him to normal. 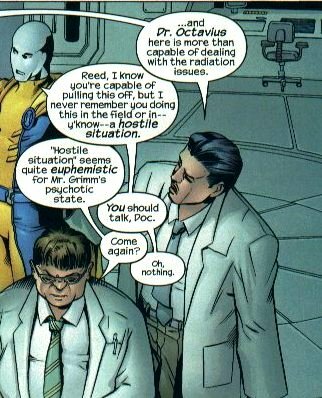 Dr. Otto Ocatavius assisted Reed Richards in the development of a method to reverse Ben Grimm's mutation. After successfully expunging the cosmic radiation from Ben Grimm's body, allowing him to regain complete control of his senses, Otto Octavius assisted Reed Richards in the development of a sedative that brought the Mimic-Brood hybrid to a comatose state so that his healing factor could get a foothold and kill off the Brood Queen embryo within him. After being bombarded by cosmic radiation while on an experimental space flight, Reed Richard discovered he could stretch, deform, expand, or compress himself into any contiguous shape he could imagine. After being beaten by his friend Ben Grimm, who had been mutated into a savage monster, Reed Richards went to Stark Industries in downtown Manhattan to discover a method to reverse Ben Grimm's violent mutation. After successfully expunging the cosmic radiation from Ben Grimm's body, allowing him to regain complete control of his senses, Reed Richards (with the help of Tony Stark and Otto Octavius) developed a sedative that brought the Mimic-Brood hybrid to a comatose state so that his healing factor could get a foothold and kill off the Brood Queen embryo within him. 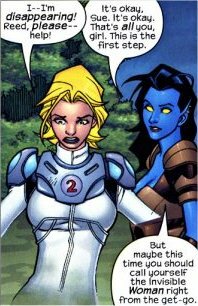 After being bombarded by cosmic radiation while on Reed Richard's experimental space flight, Susan Storm found that she had the power to bend light without distortion and produce psionic force she could shape into highly resistant protective fields and relatively simple forms. After being beaten by her friend Ben Grimm, who had been mutated into a savage monster, Susan Storm traveled to downtown New York City so that she could control the crowds frightened by Ben Grimm's rampage. Learning how to better control her newfound powers from the reality-hopping mutant known as Nocturne (TJ Wagner), Susan Storm stopped a stampede of frightened New Yorkers and later battled the Brood-implanted mutant known as Mimic. The owner of Stark Industries in downtown Manhattan, Tony Stark assisted Reed Richards in the development of a method to reverse Ben Grimm's mutation. After successfully expunging the cosmic radiation from Ben Grimm's body, allowing him to regain complete control of his senses, Tony Stark assisted Reed Richards in the development of a sedative that brought the Mimic-Brood hybrid to a comatose state so that his healing factor could get a foothold and kill off the Brood Queen embryo within him.